What to expect? How is it packaged? How easy is it to configure? Can-Am cabinets are packaged extremely well, so they reach you in perfect condition. We know how to build great cabinets and how to get them to you. We've been doing it for more than 30 years! Click play and watch. CAN-AM Cabinets are fully assembled. Unpacking instructions are provided. 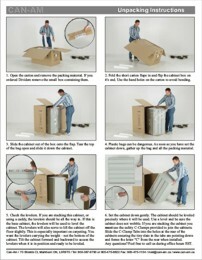 Step by step instructions will guide you from unpacking to placement. Every effort is made to minimize lifting. Installing Legs or Wheels are easy too. Click the desired PDF icon to view the instructions now, or right click the icon and select "Save Target as ..." to save a copy to your computer to view or print later. Go Ahead. Your dream setup is just a click or phone call away.